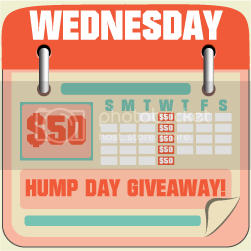 It's time for Hump Day $50 Giveaway and today's event is for Google Friend Connect (GFC) or Google+ Circles. Thanks to the 33 wonderful blogs listed below, we are giving away $62 this week and not $50. Yep you get some bonus so please feel free to visit their blogs after joining. My Tots Exactly | Frugal Experiments | Money Saving Mindy | Filipino Virtual Assistant | Tinkerputt's Turf | Blog Contests & Giveaways | Shop Vintage Clothing | Vienna Daily | Coupon Queen of Texas | Mommy Coupon Swappers | Life According to Me | Mole On My Sole | The 24-hour Mommy | WAHMaholic blog | Certified Foodies | Teach Me 2 Save | WAHMaholic Blog Designs | Extreme Personal Measures | Building Carpenters | Kenzie's Kozies | The Food, the Places and the Badtrips | Happy Home & Family | mumwrites | Living Life to the Fullest | Mom's Online Magazine | Charming Junkie | Workaholic Me | Topics on Earth | Mom's Ups and Downs| Pinay Mom in Germany| Life's Cheap Thrills | The Wandering Purple Diva | Make Money Online There are 2 types of entries this week. You can follow a blog though it's Google Friend Connect (GFC) button, or to add a blog page to your Google+ Circles. For a short tutorial on how to Follow via GFC or to Add pages to your Google+ Circles, click here but be sure to come back to enter through this blog. A note though: You can only join this on one blog/page. There will be a maximum of 39 entries ONLY. If you have more than 39, I reserve the right to delete duplicate or fraudulent entries. May I request that you use only one name and email address for quicker validation of entries. On the first mandatory entry, please do not forget to write Tinkerputt's Turf referred you since it is a mandatory entry. You must complete the first 2 tasks before the others are enabled, and for all your other entries to count. Thank you very much and good luck. By joining this giveaway, you agree to the Terms and Conditions on the bottom of the form. Contest is open all-day Wednesday, from February 1st, 12:01am EST to February 1st,11:59pm EST (February 1st, 1:01pm Philippine time to February 2nd, 12:59pm Philippine time). A Call for Breastfeeding Moms - Breastfeeding to the Rescue!